This technical note will provide step-by-step instructions of how to cull similar documents in preparation for a Review Set. Once you have uploaded all documents to your case, the next step is to identify similar documents and only work with the relevant data as part of you pre-production strategy. The process of culling electronic store information (ESI) helps you to reduce a large pool of documents to a smaller set, which will automatically reduce the amount of documents requiring review. There are three methods of culling in our platform: DeNIST, data range and Keyword filter. 2-Date Range Culling. When you upload MSG or PST files to a case in Lexbe eDiscovery Platform, it will also extract the metadata (below) from each email, and writes it to the metadata fields including the 'Master Date' and 'Date Sent'. You can use a date range based on those date fields to filter out files outside of a date filter range. 3-Culling from Keyword Filter. You can create 'Boolean keywords' to filter out files that do not contain keyword hits. 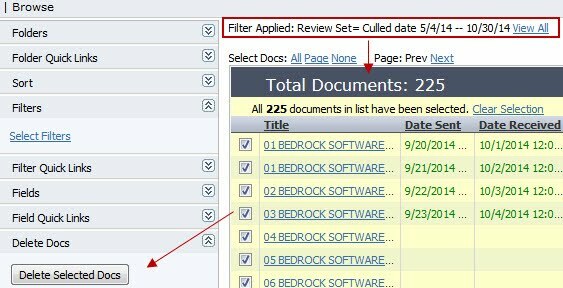 1-Under 'Filter>Select Filter' section, apply filters by a date range under the Master Date (mm/dd/yyyy) format. For example, Master Date Start=1/1/1980 Master Date Before Date=3/10/1999. In the following picture, the filter displays the results of a specific set of documents ranging from 51/1/1980 - 3/10/1999. We also created a 'saved & shared' filter by date range called 'Culled date 1/1/80 - 3/10/99 '. If during the uploading and processing custodians were assigned to set of documents, you can also filter by custodians and date range to narrow the search results even further. From the Browse and Search pages, you can select the filtered documents and tags to export to an Excel spreadsheet. The Excel log allows you to generate a report that can be filtered, sorted for further analysis in Excel. You can also all the filtered documents displayed on a Browse, and then export the physical documents to a Briefcase. a) From the Browse page open the saved & shared filter based on a date range. (e.g. Culled date 1/1/80 - 3/10/99). b) Select all document 'Select Docs: All'. c) Expand the section 'Review Sets'. d) In the drop-down menu for 'Add Docs to Review Set', select the Review Set related to the culled data. NOTE. The page for creating Review Sets (Account>Manage Review Sets) is an administrative exclusive to Admin Users in the account. If you do not see this option and you believe you should have administrative rights to the account, please contact your Account Admin Users for user upgrading. e) Go back to the Account>Manage Review Sets, select your review set by the title and then click on the 'Start Review' button. Email Expansion Within Review Sets. When you click on the 'Start Review' button, the total number of documents 'Total Docs' in the batch will expand if the set of documents filtered includes email families. Let's say that you initially add 12 documents to a Review set and some of those are email families (email body + attachments). After clicking on the 'Start Review' button the 'Total Docs' will increase, which means that the number of parents and the number of attachments are also in the review set (11 parents and 15 attachments). This allows you to propagate the coding to all documents consistently as you can see in the screenshot below. f) Review the set from the Discovery>Review Batch page, by clicking on the 'Get Batch' button. Then under the 'Review Batch' section, please click on the 'Review Docs in Batch' hyperlink. g) When you click on 'Review Docs in Batch' hyperlink, your Document Viewer will open with the first document in your Review Batch. b) On the Search page, use the 'Boolean' option to set up the keyword search. This allows you to search using Boolean syntax and operators. After the Boolean search brings the result, select all the documents and then use 'Multi Doc Edit' to tag them using the custom tag based on the keyword filter. c) Create a temporary Review Set based using the same name of the custom coding field (e.g. Jeff Skilling AND expense report). d) On the Browse page, filter on the keyword custom field. Add documents to the Review Set. This step will expand the keyword search to include the attachments. e) On the Manage Review Set page, click 'Start Review' to expand the Review to include the attachments. 1-A temporary Review Set, and clicking the 'Start Review' button to expand the email families (email body and attachments). Then you can click on the Review Set title 'Culled date 5/4/14 -- 10/30/14'. When you click on the link title, it redirects you to the Browse page automatically filtering on set of documents you added to the specific review set including the email body and attachments. Then from the Browse page, select all document and delete them from the case. We also offer eDiscovery Consulting and Technical Services (billable hourly) if engaged to support your efforts to review complex documents by helping you to cull data and executing specific requests for document identification. Please contact your sales representative or our Support Center if needed.